The yeast free Candida diet is a healing diet for your gut. While the diet takes away the foods that aggravate the yeast overgrowth symptoms and does play a role in starving the yeast, the Candida supplements are the real fighters! A good anti-fungal supplement will help get the overgrowth back into a healthy balance quickly and maximize your diet results. 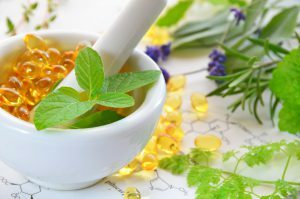 Below is a listing of several common herbs and supplements for use on the yeast free Candida Diet. Many of the Candida supplements listed below serve a similar purpose so choosing one of the options below may be all you need. Talk to your doctor or health professional about a combination that may be right for you. This list is not exhaustive but is intended to provide a starting point. SF722 — a derivative from the castor bean plant, SF722 provides potent fatty acid support of healthy gut and vaginal flora and is said to prevent yeast cells from multiplying. Grapefruit Seed Extract — anti-microbial said to help against parasites and fungi including Candida. Opinions about effectiveness of GSE vary. Read more. Coptis — contains potent herbs that combat fungal growth and has been used to treat a wide range of symptoms from fever to skin conditions. Contains antibacterial, anti-inflammatory, and anti-diarrheal properties. Read more. Spilanthes — sometimes used along with Coptis it contains natural antibacterial and antifungal properties and has been shown to aid in inhibiting fungal growth. Read more. Caprylic acid — is a saturated fatty acid known for its powerful antifungal properties and effectiveness in suppressing fungal infections associated with yeast overgrowth. Read more. Garlic — garlic use has many benefits including as an antifungal and has been reported to be helpful for digestive disorders. See all the ways garlic can benefit you on the Candida Diet here. Oil of Oregano — said to contain antifungal, antiviral, antibacterial and anti-inflammatory properties. Learn more about the health benefits of oregano oil here. Most of the items above can be found online, at a local health food store or through a licensed health professional. Many people respond differently to certain Candida supplements so there is no one right answer. Finding a combination of anti-fungal supplements to cleanse the body along with a healthy yeast free diet to keep the yeast in check is the basis of the yeast free Candida Diet. *It is always recommended to consult a licensed medical practitioner regarding your specific situation before undergoing any new diet or supplement program. theyeastdiet.com does not recommend or endorse any particular brand or combination of Candida supplements.